The workbench feature is broken down into four separate features, one for each of the Grot Tanks. 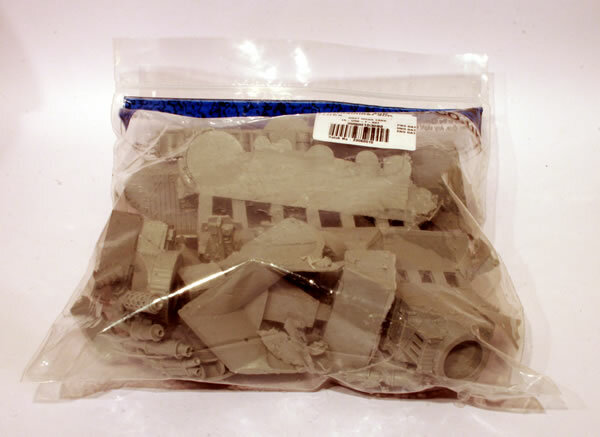 I picked up the Grot Mega Tank at GamesDay 2010. 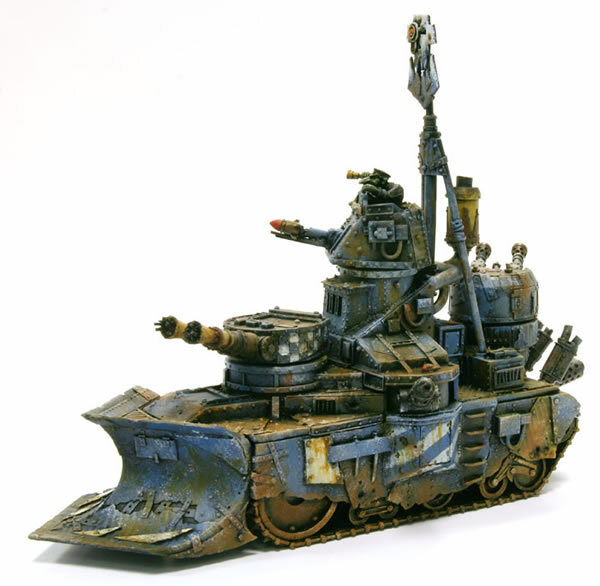 Designed by Stuart Williamson, the Grot Mega Tank represents the pinnacle of Gretchin-built Heavy Tank technology; an overpowering war machine that drives all before it in a storm of scrap and destruction. This full resin kit is festooned with unique details as you can in the images, and Stuart has designed each turret to be fully cross-compatible with Daren Parrwood's Grot Tanks. 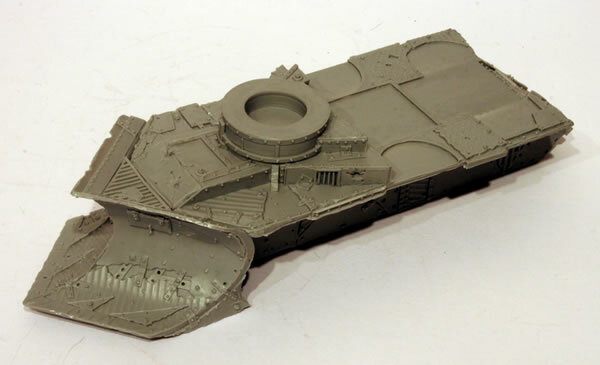 Hammered together out of junk, spare Mekboy know-wotz and unbridled Grot enthusiasm, the Grot Mega Tank adds even more firepower to the battlefield madness that has come to be known as a Grotzkrieg, terrifying Imperial Tacticians, Eldar Farseers and Chaos Warlords alike. I really do like this model alongside the Grot Tanks. The model is very ship like with battleship style turrets and a prow shaped bow. 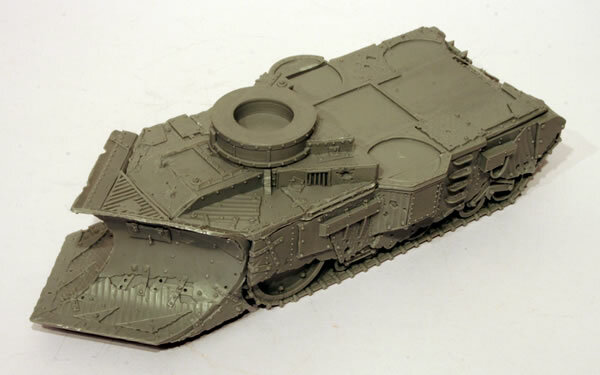 It is a very ramshackle vehicle and looks like (as it should) if the grots have just thrown it together from parts lying around the battlefield and stuff stolen from a Mek workshop. 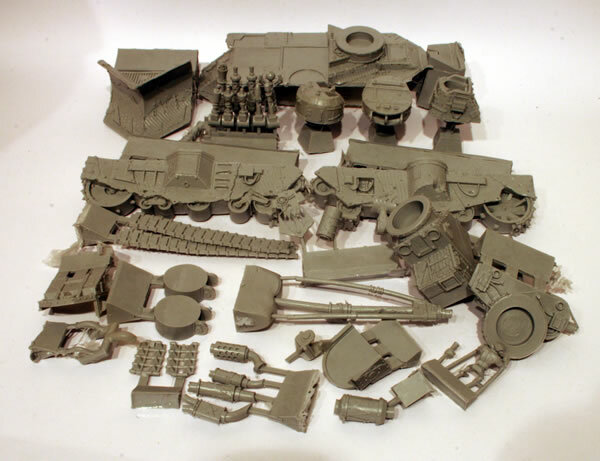 The turrets are interchangeable with those of the plastic Ork vehicles and the Grot Tanks allowing you an opportunity to convert the Mega Tank into a different looking model. Useful if you were to get two. 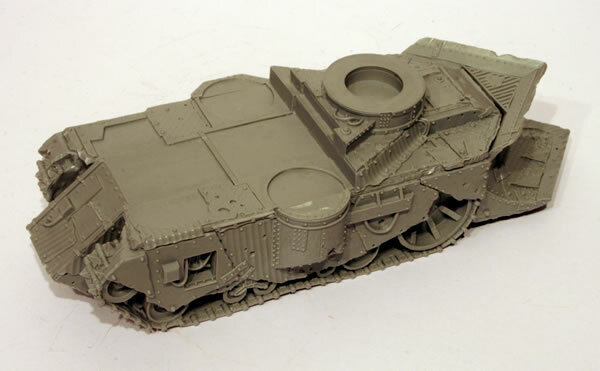 Before making it up I had a good look at the pictures on the Forge World website. You do get one big bag of resin. I then cleaned the flash and removed the pieces from the sprues. You should always take care doing this as it is possible to break the parts as resin is much more brittle than plastic. The main hull was then stuck to the front ram or Doza Blade. The tracks were then added to each side. I didn't think that they were particulaly well designed to join the main hull. I might later stick some green stuff between the inside of the tracks and the hull.